An excavation in a part of Jerusalem known as the City of David has uncovered stone markings that date back thousands of years. Nobody has any idea what they are or what they mean. But whatever it is? It's important. The v-shaped markings (not be confused with our other favorite mysterious markings) are on the floor of a recently uncovered room at the dig site. They are about two inches deep and twenty inches long. Nothing else has been discovered that suggests what they are or who made them. (Is it too early to suggest aliens?) "The markings are very strange, and very intriguing. I've never seen anything like them," said Eli Shukron, one of the dig's directors. They can tell from some ceramic fragments that the room was last used around 800 B.C., when the area was under the rule of Judean kings, but it is not known whether the markings were made then or long before. What Are the Mysterious Markings Found In the Great Pyramid&apos;s Hidden Chamber of Secrets? It's fitting that we don't know what the markings are, though, because nobody knows what the complex they're in was for, either. (**cough** alien sacrifice **cough**) It's large, and it is located right next to the city's well, which suggests is was rather important, but exactly what it was is still a mystery. 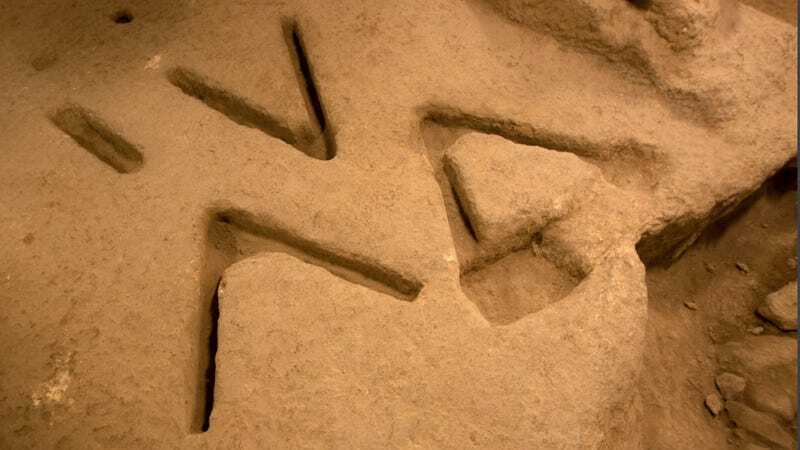 In a room adjacent to the carvings they have discovered a large stone which could have been an altar or a grave-marker that pre-dated the Israelites. However, archeologists are quick to point out that that doesn't mean the place was a temple, necessarily. It could have just been one room that was dedicated to devotion. These new markings are another interesting chapter in what is one of the most politically volatile archeological digs in recent history. The site is in East Jerusalem, which was taken over by Israel in 1967, but is still claimed by Palestine. The dig is funded by the controversial Israeli nationalist group Elad, known for their involvement in the Israeli settlement movement. Basically, the site is already under heavy scrutiny, and these new findings are only going to turn up the heat.